Khyber Pakhtunkhwa Small Industries Development Board Peshawar has announced the jobs 2019 nowadays if you are eligible and fulfilling the criteria then you must apply before the closing date because after the closing date application form will not be entertains. Khyber Pakhtunkhwa Small Industries Development Board Peshawar invites applications from suitable candidates domiciled in Khyber Pakhtunkhwa for the following post Junior Clerk. They have assigned the nts national testing service to collect the application form and then send the roll number slips and then Commence the written test or screen test to evaluate the candidates that they are eligible for these positions or not. 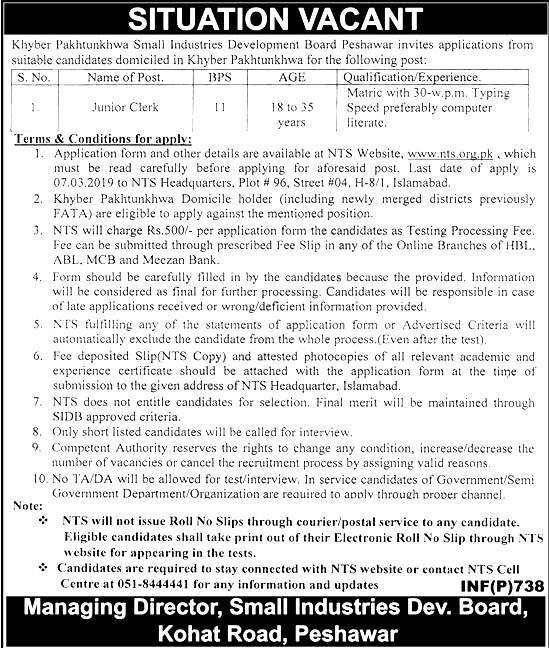 You must apply the NTS Testing service for these jobs 2019. Application form and other details are available at NTS Website, wvw.nts.org,ok , which must be read carefully before applying for aforesaid post. Last date of apply is 07/03/2019 to NTS Headquarters. Plot N 96, Street #04. H-8/I. Islamabad. Khyber Pakhtunkhwa Domicile holder (including newly merged districts previously FATA) are eligible to apply against the mentioned position. NTS will charge Rs.500/- per application form the candidates as Testing Processing Fee. Fee can be submitted through prescribed Fee Slip in any of the Online Branches of HBL. MCB and Meezan Bank. Form should be carefully filled in by the candidates because the provided. Information will be considered as final for further processing. Candidates will be responsible in case of late applications received or wrong,/deficient information provided. NTS fulfilling any of the statements of application form or Advertised Criteria will automatically exclude the candidate from the whole process. (Even after the test). Fee deposited Slip(NTS Copy) and attested photocopies of all relevant academic and experience certificate should be attached with the application form at the time of submission to the given address of NTS Headquarter. Islamabad. NTS does not entitle candidates for selection. Final merit will be maintained through SIDB approved criteria. Competent Authority reserves the rights to change any condition, increase/decrease the number of vacancies or cancel the recruitment process by assigning valid reasons.